The double tap is a popular option for the modern homeowner, even though there are many single tap options available. Double levers, or dual taps, need not be simple in design, and can be beautifully creative, adding elegance to your kitchen. The tap, an essential item, can sometimes be overlooked when it comes to design, but with our help you can make sure your double tap is one of the elements that makes your kitchen stylish. HC Supplies works in conjunction with exceptional manufacturers to deliver stunning double tap designs at competitive prices. Delight in our double tap collections from Rangemaster, Bretton Park and Smeg, and marvel at the beautiful designs, all available at low prices. The Smeg Pisa double tap is one of the favourite models among customers searching for contemporary style on a budget, and it is easy to see why this modern tap is so popular. The Smeg Modena double tap is elegant and futuristic, and is perfect for homeowners who enjoy cutting edge design. We have styles to suit all tastes, so why not take a look and choose the perfect double tap for your kitchen today? Why pay the full recommended retail price, when you can take advantage of great discounts from HC Supplies? By providing fantastic offers on all our double taps, we ensure customers have access to the most stunning designer taps without having to go beyond their budget. Enjoy up to 30% off quality double taps all year round with HC Supplies best price guarantee. For a closer look at our products, come and visit us at our showroom in Doncaster. Our helpful advisers can show you how to make the best of your kitchen,and can answer any questions you may have. Once you have chosen your perfect double tap, you will of course want it delivered as quickly and as safely as possible. Our experienced drivers will ensure purchases arrive at your UK address on time and in pristine condition. Customers can expect their items to arrive within 2 to 7 working days after purchase. Need your items delivered abroad? 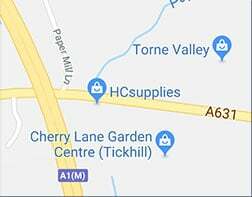 HC Supplies is pleased to be able to ship purchases overseas, and customers can arrange this with ease by speaking with one of friendly advisers. We are happy that our products adorn homes in the UK and abroad, and are delighted to be abe to offer low prices to all who shop at HC Supplies. Stuck for ideas? If you live within 30 miles of our Doncaster showroom, our design team can help to rejuvenate your kitchen. Our experts will identify which items would best suit your home and will work with you to create the kitchen of your dreams. Should you live further afield, you can still take advantage of our style advice by reading our helpful design blogs, or by speaking with our customer srevices team. Get in touch via our online contact form and we will respond as soon as possible. Revamp your kitchen on a budget when you shop at HC Supplies.